Voice responses from Alexa are now enhanced with visuals and optimized for visibility across the room. Call or message your family and friends that also have an Echo or the Alexa App, get the news with a video flash briefing, see your Prime Photos, shop with your voice, see lyrics with Amazon Music, browse and listen to Audible audiobooks, and more. All you have to do is ask. Echo Show has eight microphones and beamforming technology so it can hear you from across the room?even while music is playing. Echo Show is also an expertly tuned speaker that can fill any room with immersive audio powered by Dolby. When you want to use Echo Show, just say the wake word "Alexa" and Echo Show responds instantly. Make hands-free voice calls to almost anyone, or video calls to friends and family who have an Echo Spot, Echo Show, or the Alexa App. Use the Drop In feature when you want to connect instantly with other compatible Echo devices in your home. For example, you can drop in to ask what time dinner will be ready, see the baby's nursery, or check in with a close relative. With Alexa Announcements you can also use Echo Show to broadcast a quick, one-way message to all other Echo devices in your home. Making calls with Alexa is easy. Set up your voice profile and teach Alexa to recognize your voice. When you say, ?Alexa, call Mom?, Alexa will call your mom, even if you have multiple users in your home. When you're busy making dinner, just ask Alexa to place a call from your Echo Show to almost anyone. For news and information you can see and hear, just ask Alexa for your video flash briefing from CNN. Curious about the latest movie trailers or need a how-to video? Just ask. Echo Show helps keep you organized at home. Start a timer in the kitchen and watch as it counts down, or easily see and manage your family?s calendar. Sign in to the Alexa App to take your to-do and shopping lists with you. Just add an item to the list from home, and whoever is out shopping will see it added instantly on their Alexa App. Voice control your music Powered by Dolby, Echo Show is fine-tuned to deliver crisp vocals with dynamic bass response and expansive sound. Watch as the display comes alive to show song lyrics, custom stations, curated playlists, and album art with Amazon Music. Listen to tens of millions of songs with Amazon Music Unlimited. 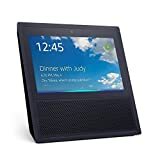 Echo Show also connects to Spotify, Pandora, iHeartRadio, and TuneIn?giving you voice control for all of your music. Echo Show is Bluetooth-enabled so you can stream other popular music services like Apple Music from your phone or tablet. Far-field voice recognition Equipped with eight microphones, beamforming technology, and noise cancellation, Echo Show hears you from any direction?even while music is playing. 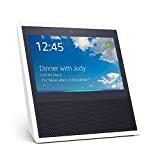 When you want to use Echo Show, simply say the wake word, "Alexa" and Echo Show lights up and streams audio to the cloud. The Alexa Voice Service is then leveraged to recognize and respond to your request instantly. If you have more than one Echo Show, Echo, or Echo Dot, Alexa responds from the Echo you're closest to. If you want to limit your interaction with Alexa, simply turn the mic/camera button off. Control your smart home Use Echo Show to see a live camera feed from the nursery or your front door. Turn on the fan or dim the lights from the couch?all without lifting a finger. Control multiple devices at scheduled times or with a single voice command, like locking the doors and turning off the lights when you go to bed (Coming soon). Echo Show works with smart home devices such as cameras, lights, fans, thermostats, garages, sprinklers, and more. Always getting smarter Alexa?the brain behind Echo Show?is built in the cloud, so she is always getting smarter. The more you use Echo Show, the more it adapts to your speech patterns, vocabulary, and personal preferences. And because Echo Show is always connected, updates are delivered automatically. Skills add even more capabilities like making a dinner reservation with OpenTable, requesting a ride from Uber, tracking your steps with Fitbit, trying a new recipe from Allrecipes, and more. New skills are being added all the time. You can also see ratings and reviews to learn what other customers are saying about skills in the Alexa App. The vast majority of device failures occur because of accidents. By protecting your device with #1-rated protection from SquareTrade, you're covered from day one for damage caused by common accidents, including: Knocking it off a table Dropping it in water Your dog chewing on it SquareTrade covers your device from all electrical and mechanical failures, including battery replacements if the original battery won't hold at least a 50% charge. What's covered? Protection from Drops, Spills & You Drop it? Spill on it? No worries. We cover accidents caused by you and people you know. (Plan doesn't cover intentional damage, loss, or theft.) Mechanical/Electrical Failures from Normal Use Repairing your average mechanical or electrical failure can cost as much as buying a new device. We cover you beyond the manufacturer's warranty. How long is it covered? Coverage Type Year 1 Additional Years Purchased Drops & Spills Coverage Device Protection Plan by SquareTrade Device Protection Plan by SquareTrade Normal-use Failure Manufacturer's Warranty Device Protection Plan by SquareTrade What else does a plan include? 2-day Replacements If your device breaks, file a claim and get it replaced in 2 days. Free Shipping We'll ship you a replacement device and provide a prepaid shipping label for you to send us your broken device. Cancel or Transfer Anytime Customers receive a full refund if they cancel in the first 90 days. Refunds are pro-rated after that. Transferring your protection plan is free and can be done online or over the phone. Electronic Delivery We'll email your protection plan to you within two hours of purchase. (Remember to check your spam folder if you don't see it.) How does it work? Call 1-866-374-9939 from 6am to 10pm PST, 365 days a year. We'll ship you a replacement device (same or newer model depending on availability). You'll also receive a pre-paid shipping label to send your damaged device back to us (must have a valid credit card on file in order to receive a replacement). Return your damaged device within 30 days from reception (otherwise you will be charged the price of the replacement). Things to know: Upon purchase, you'll receive an email. This will be your official purchase confirmation. To give you the best customer experience possible, SquareTrade may also contact you about your purchase by telephone. Please read the terms and conditions (see the link at the bottom of the page). Start Date: Plan begins on the date your device ships (or when your device ships for pre-ordered devices) and is inclusive of the manufacturer's warranty period. For pre-ordered products or items that are delivered late, call SquareTrade to extend your protection plan to the actual ship date. If you have an issue and are covered by the manufacturer at that time, you'll be directed to the manufacturer first. For assistance, call 1-866-374-9939, 6am to 10pm PST, 365 days a year. An agent is always happy to assist you. 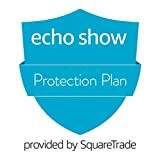 Legal Disclaimer The Protection Plan + Accident Protection for Amazon Echo Devices is only available on an Amazon Echo Show that has been shipped within the last 90 days and is only available for customers who are residents of the United States. Full Service Agreement Still have questions? Give us a call at 1-866-374-9939.